The congestion-fighting concept is simple – drivers without passengers will now be able to use the HOV system by paying a toll, on the I-45 South HOT Lanes, prices range from $1 to $4.50, based on the time of day and level of congestion. The Gulf Freeway is the first corridor in METRO’s 84-mile HOV network to undergo the transformation, with US 59 South, IH-45 North, US 290 and US 59 North to follow. A gradual opening of the HOT Lanes started on Monday, Feb. 13. The grand opening occurs Monday, Feb. 20. Cash is not accepted in the HOT Lanes but drivers will be able to use any of the following authorized toll tags: Metro HOT Lanes Toll Tag, Harris County EZ Tag, TxDOT’s TxTAG or the Dallas NTTA Toll Tag. In addition to posting updates regarding METRO’s HOV-HOT Lane conversion on the agency’s website, METRO also launched an educational campaign – I Hate Houston Traffic, which included billboards, radio spots, and print and digital ads. The agency invited the congestion-loathing community to its Facebook and Twitter sites to open up the conversation about the project, educate and answer questions. I wonder if there are any plans to install a physical barrier (maybe something like the tall, flexible plastic rods used on the Sam Houston Tollway) between the new HOV lanes in the vicinity of Huffmeister and 1960? I’ve had several vehicles jump from the stopped main lanes into the HOV lane since the new lanes opened and as a result I normally go 40-45mph in the HOV land through that section to give myself more time to react in case someone pulls into the HOV lane unexpectedly. METRORail service will be suspended for three weekends in September and October to allow Texas Children’s Hospital to continue construction on a pedestrian bridge over Fannin Street that will connect all of the hospital’s patient care facilities. Friday, Sept. 23 at 9:00 p.m. to Sunday, Sept. 25 at 11:59 p.m.
Friday, Oct. 14 at 9:00 p.m. to Sunday, Oct. 16 at 11:59 p.m.
Friday, Oct. 21 at 8:00 p.m. to Sunday, Oct. 23 at 11:59 p.m.
During the shutdown, rail customers will be served by shuttle buses (Route 700) running parallel to the rail line, both north and south, except in the Medical Center. Patrons who normally board from the Memorial Hermann Hospital/Houston Zoo or Dryden/TMC station platforms can find the shuttle bus on Main Street for travel north and southbound. Buses will not be able to access the UH-Downtown Station due to construction. Normal rail service will resume Monday, September 26, October 17 and October 24, 2011. METRO will change its rail service this weekend due to continued construction of an enclosed pedestrian bridge over Fannin at the Texas Children’s Hospital. Beginning at 5 a.m., Saturday, Oct. 23 until 2 p.m., Sunday, Oct. 24, two-car trains will operate only on the northbound track between the Smith Lands and Hermann Park/Rice University stations. As a result, all riders will be required to board and exit the trains on the northbound platforms at these locations. Trains will be traveling in both directions using the same track, so riders will need to pay special attention to the destination signs on the front and sides of the rail car. METRO personnel will be available to provide assistance. Trains will run every 20 minutes during the service interruption. Normal service will resume by 2 p.m., Sunday. Looking For Your Lost Items? As of today, METRO’s Lost & Found is now located at the 1900 Main RideStore. The one-stop shop allows customers to conduct all their business from the first-floor lobby location – whether its recharging their METRO Fare Card, inquiring about route/schedule information or stopping by to see if their lost item has been recovered. Customers who need help locating a lost item can call the Lost & Found line at 713-658-0854. Hours will be Monday to Friday, 8 a.m. to 5 p.m.
Each year, the Houston Zoo experiences high attendance, averaging 8,000 or more guests each day. As you can imagine, that level of attendance brings with it increased traffic and increased demand for parking in Hermann Park. There’s obviously not 8,000 parking spaces in the area. So, we have a suggestion to help the flow of traffic. * Carpool: Meet at one house and pack your car full of friends. * Consider being dropped off and picked up. * Ride METRO’s bus system or METRORail to Hermann Park. Find More information: www.houstonzoo.org. Information will also be posted on the Houston Parks and Recreation Department Web site at http://www.houstontx.gov/parks/index.html. Once you get past the parking/transportation situation – it’s ALL fun! Just check out how close I was to the 15 foot giraffes. They are incredibly friendly and docile. Michael Reina helped the Channel 2 crew get around the Houston Zoo. After feeding the giraffes, it was time for work. I couldn’t play forever though. I had a story to turn. After taking pictures with our tour guide, zoo keepers, photographers and the giraffes…it was time to interview, Kim Siegl, a Hoofstock Keeper. She said working at the zoo was a dream job. The toughest element was having to deal with the weather changes-as Houston can go from sweltering hot to bitterly cold. And a lot of the time they have to be out with the giraffes. Questions, questions and more questions. My visit wouldn’t have been complete without dropping by the newly renovated jaguar exhibit. Angie Pyle, the senior carnivore keeper says that one of the most popular questions she gets asked is about Kam Balam, one of the cats. He hops along because of an old injury. 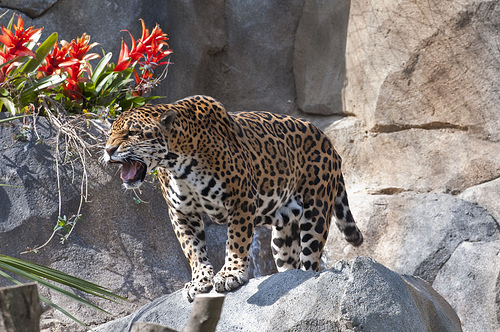 In another facility, Kam Balam put his paw in another jaguar’s cage and it was taken off. This was years ago and they say he’s adapted just fine. Inside the re-designed Jaguar Exhibit. I’LL BE EMCEEING THE CEREMONY FOR THE START OF THIS NEW SERVICE ON THURSDAY MORNING. METRO has joined the Energy Corridor District to launch the 75 Energy Corridor Connector, starting Monday, Jan. 25, 2010. This new service, which runs along Eldridge between the Katy Freeway and Westheimer, provides employees and residents who live and work in the Energy Corridor District with a quick, convenient ride to stores, restaurants and businesses along the route. Energy Corridor District employees who live in the downtown and midtown areas can connect to the 75 Energy Corridor Connector by riding the 228 Addicks and 229 Kingsland/Addicks from the Central Business District to the Addicks Park & Ride. The Connector also links with popular routes like the 82 Westheimer and the 131 Memorial. When Pasadena’s new park and ride opens next month, commuters will have a new, convenient and inexpensive way to reach destinations in downtown Houston or the Medical Center. In addition, the City’s economic director, Paul Davis, said riders will get an added benefit for the first week the park and ride is open: free bus fare. He said the projected date for it to be fully operational is set for Monday, April 6; if that date holds, the free week of riding would begin that day. After that first week, fares will be the same as METRO’s other Zone 3 park and ride services, with a one-way fare currently set at $3.75. Patrons using the service will also be eligible to use METRO’s guaranteed ride home program and will be able to connect to other portions of the METRO system. The park and ride’s buses will depart from the northern part of the Pasadena Town Square Mall parking area, located at Harris Road and Pasadena Boulevard. Riders who board the bus in this location can remain aboard to travel to destinations downtown, or can ride the bus to METRO’s Monroe park and ride, where they will transfer to another METRO bus for destinations in the Medical Center. Service hours are from 5:45 a.m. until 7:25 a.m. and from 4 p.m. until 6 p.m. with departures every 25 minutes, which are the times when commuters working downtown or the Medical Center are most likely to utilize bus services. Davis said the new bus service is the result of a partnership between the City of Pasadena, Harris County and Houston METRO. Funding for the park and ride will come from a combination of sources, including the Houston-Galveston Area Council, which will provide 75 percent of the funding through a grant from the Federal Highway Administration, and the Second Century Corporation, which will provide up to $35,000. METRO will build the bus shelter and do the striping. There is no tax obligation for the City.